Have you been to south Florida? It’s a great vacation destination to relax with warm temps and cool breezes, when it doesn’t randomly rain. Also a place of great inspiration, such as this latest free crochet hat pattern. My husband is from Miami, so at least once a year, we take a family trip down to visit our extended family. A great part of the trip is being able to spend quality with my husband by leaving the kids with grandma. Raise of hands for those that take any chance to let the kids have quality time with a grandparent! As we traveled along through Ft. Lauderdale, we rode along Las Olas Boulevard at sunset. It was an amazing view of red and orange light casting over the water and sandy beaches. I had a skein of Hobby Lobby’s Yarn Bee Hint of Silk in royal purple (my fav color!) 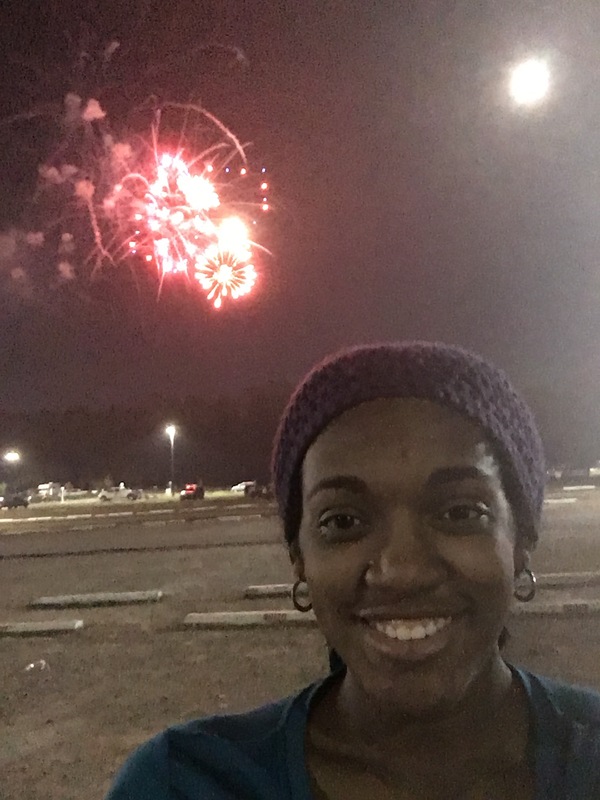 with me, and I was inspired by the evening’s sunset. Accordingly, this design was named the Las Olas Hat. For those that don’t know Spanish, Las Olas means waves. And if you haven’t tried Hint of Silk, you must! It’s so soft and great for hats to avoid the dreaded pulled hair. For those with natural hair, this is an added benefit because you twist out will stay neat without knots that can happen with a wool or some acrylic yarns. 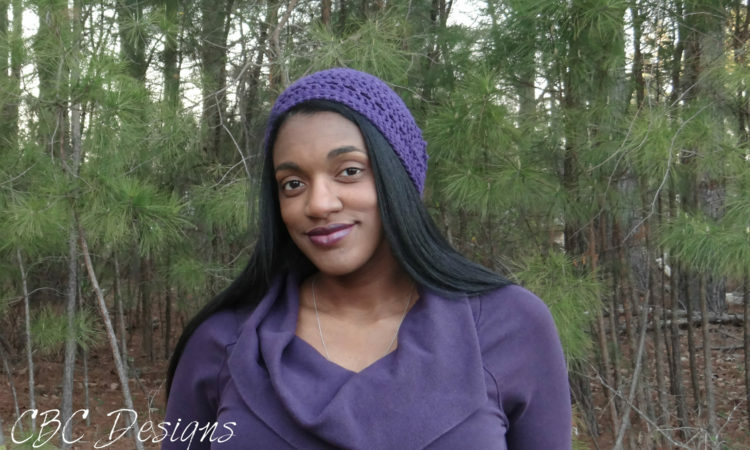 Now on to the free crochet hat pattern! Gauge: 7 dc x 4 rows = 2” (5 cm) x 2″ (5 cm) across dc rows and not the sc. First-dc, *dc in ch-1space, dc in next st. Repeat from * to end. Measure swatch to check gauge. Change to a smaller or larger hook as needed. The pattern ensures that only one skein is needed, but if you choose a different yarn, you may have different results; adjust the hook size as necessary. 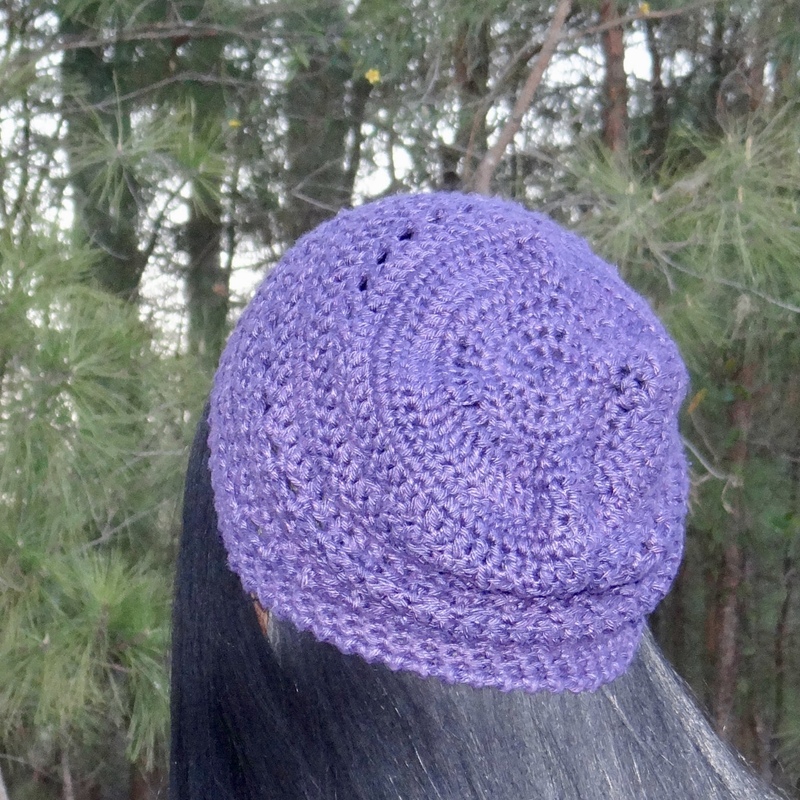 Pattern includes three options for finishing the hat, two create the cinched look of a bottom up hat, and the third option creates a flat closing similar to top down hats. Round 1: With larger hook, fsc 63, slst to join to create a circle without twisting the chain, turn. Using a large-eye needle, thread the long tail, flip hat to wrong side, and fold the hat in half and pull tail through center; fold in half again and weave through the center. Continue to fold in half and bring the folds into center and weave through to secure the center and create the top of the hat. Once all folds are gathered, pull tight, knot to secure, and weave in end. Using a tail 6-8” long, thread yarn needle and weave under both loops of first stitch, *skip next stitch, weave under both loops of next stitch. Repeat from * around to last stitch, turn hat inside out, and pull tight. Weave through the center a few times, then finish off. I look forward to seeing your completed projects on the ‘Gram and use #CBCDesigns so that everyone can admire your work. and follow me on social media for more crochet and yarnie goodness! Hi Tamera. Thank you for your support. I updated the pattern after seeing your question this morning. You should’ve have received the notification through Ravelry. Let me know is there is any other questions.